I took this photo at Hard Pressed Cafe in Cape Town. My short review can be found over hither. Posted in General and tagged coffee, restaurant on Thursday, 6 November, 2014 by Paul. Posted in General and tagged eden on the bay, restaurant on Wednesday, 2 July, 2014 by Paul. 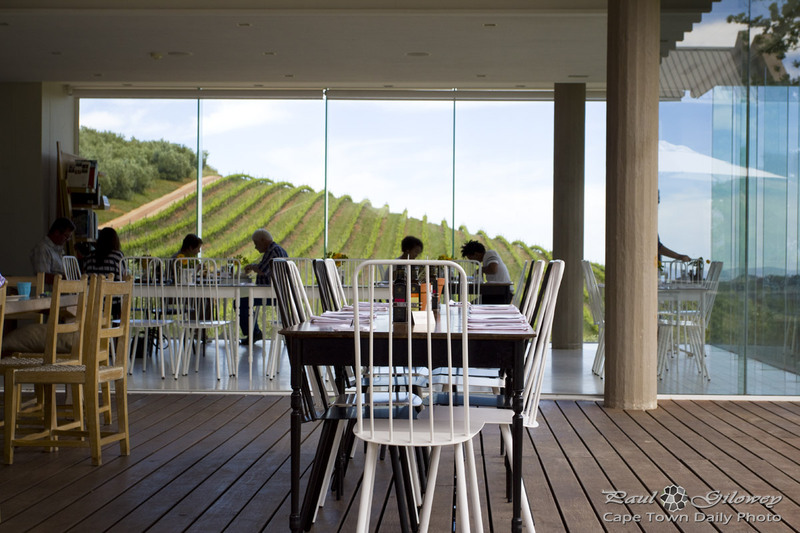 We'd often heard of Tokara, the wine and olive farm, but never visited - so we "whooped" and patted ourselves on the back when we discovered that they served breakfast until 12pm! We rushed off to Stellenbosch, and ascended the Helshoogte mountain pass, arriving at Tokara at 11h40, just in time to order breakfast. It's a beautiful place, and I'll post a few more photos, but in the meantime let me say that you really want to visit the delicatessen (where this photo was taken). The (huge) croissant, bacon, and eggs combination was both delicious and well priced - and their coffee, well let's say that they sure know how to make coffee. Posted in General and tagged breakfast, deli, restaurant on Thursday, 21 November, 2013 by Paul. Posted in General and tagged restaurant, sea on Monday, 28 January, 2013 by Paul. Posted in General and tagged restaurant on Wednesday, 16 January, 2013 by Paul. We visited The Woodlands Eatery in the suburb of Vredehoek (just above the city center) for lunch - the traditional Italian pizza was delicious. In fact, I ate far too much. The Woodlands Eatery has a pretty relaxed feel, our lunch appeared on our table in a reasonable amount of time and the staff were friendly, though not intruding. The part of the establishment in this photo is mostly used for evening dining - but I decided to post it to show some of the eclectic decor that fills the little restaurant. Unusual, interesting, and pretty awesome, don't you think? Posted in General and tagged restaurant on Tuesday, 8 January, 2013 by Paul. Boerewors rolls (aka boerie rolls) are to South Africans much like burgers are to Americans, or pizzas to Italians - they're practically a staple food. 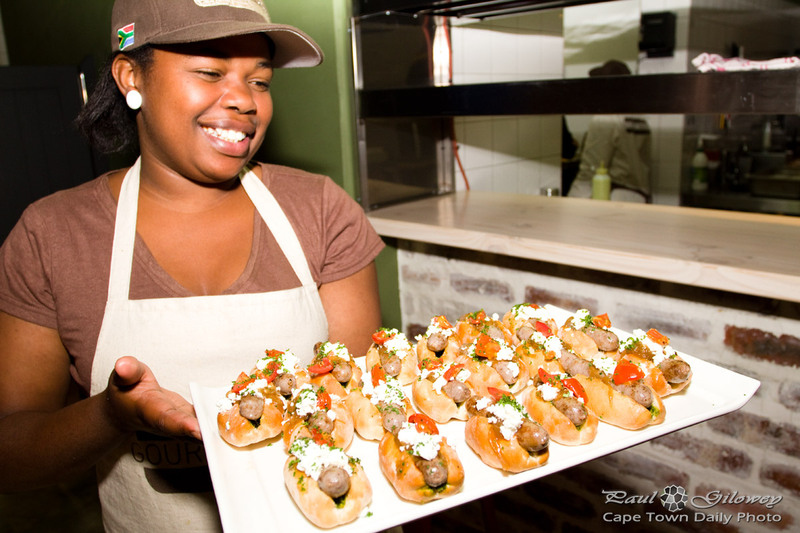 Boerie rolls have been sold at sports events, festivals, and even along side the road for about as long as South Africa's been South Africa. They're common at braais, and the perfect emergency meal for a Friday evening, when you really don't feel like cooking. 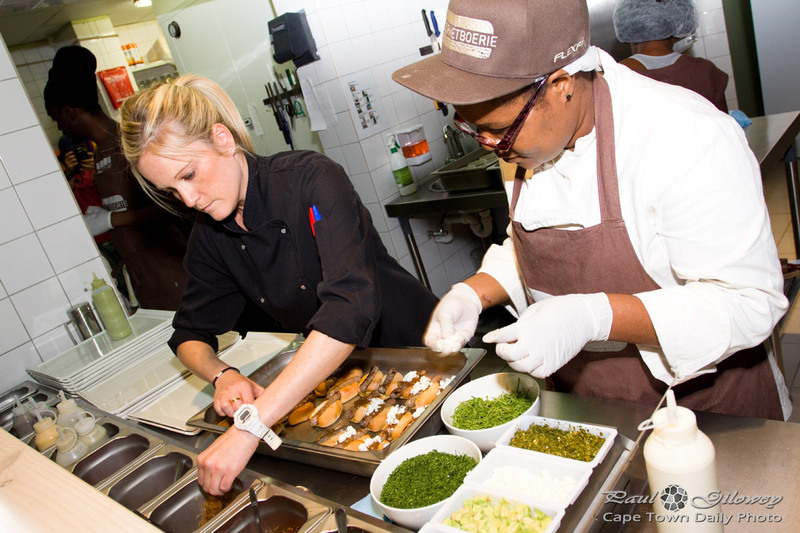 A friend and I visited the Gourmet Boerie (map) launch party on Saturday evening - and OMW, the food was outstanding. Boerewors rolls are normally cool, but Gourmet Boerie's extensive menu that includes gorgonzola, bacon, pecan nuts and rocket, with the choice of lamb, chicken, beef and ostrich sausage, along with the option of white, whole grain, or even rye rolls really takes the traditional braai meal to another level! It really was that good. South Africans, don't you think it's strange that it's taken so long for a restaurant selling gourmet borie rolls to appear? I'm sure most of us would kick ourselves for not coming up with the idea first! Posted in General and tagged restaurant, restaurants on Monday, 19 November, 2012 by Paul. 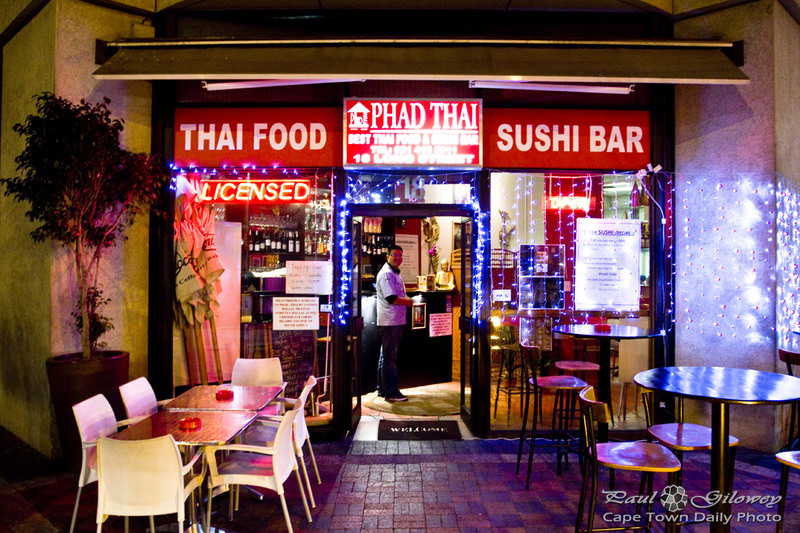 If in the past you've been a great fan of Sawadee (that little restaurant just off Kloof Nek Road) then perhaps you'll be pleased to know that their sushi chef has move and opened a restaurant lower down on Long Street, where it intersects with the brick-paved Waterkant Street (map). We met up with a friend at Phad Thai on Saturday evening. The sushi was as great as it had been at Sawadee, and the restaurant wasn't as noisy or crowded as I believe it can be during lunch hours. It's not a pretentious restaurant by any means - the décor is modest, and there's no need to haul out your best Levis, or most plush dress. If you've never been, you'd probably do yourself a favour to visit pay Phad Thai a visit for a late lunch or early dinner. Posted in General and tagged city center, restaurant, sushi on Monday, 1 October, 2012 by Paul. 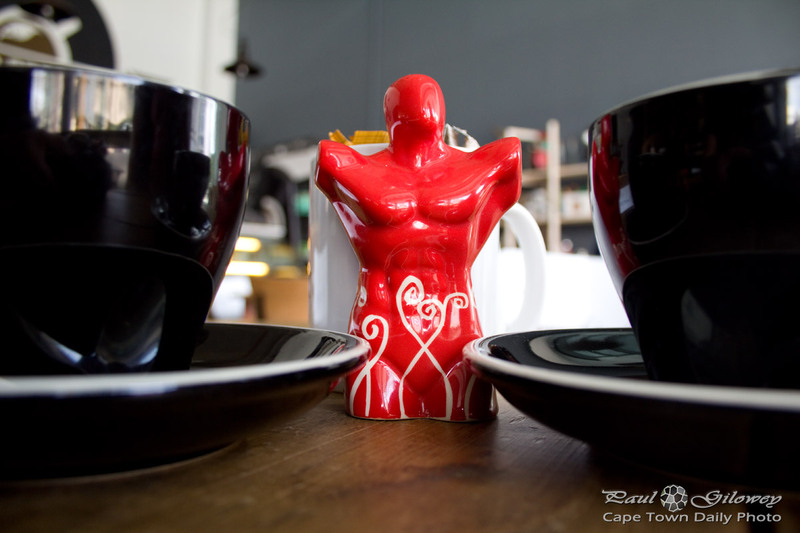 I spotted these singing-dancing men at Eden on the Bay's African-themed restaurant, Moyo. 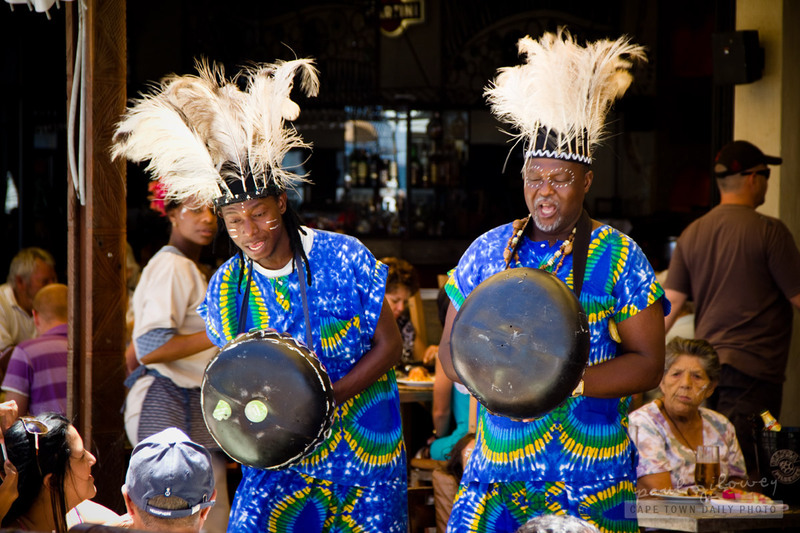 Part of the appeal of enjoying lunch or dinner at Moyo is exactly this, the entertainment that goes along with the visit. 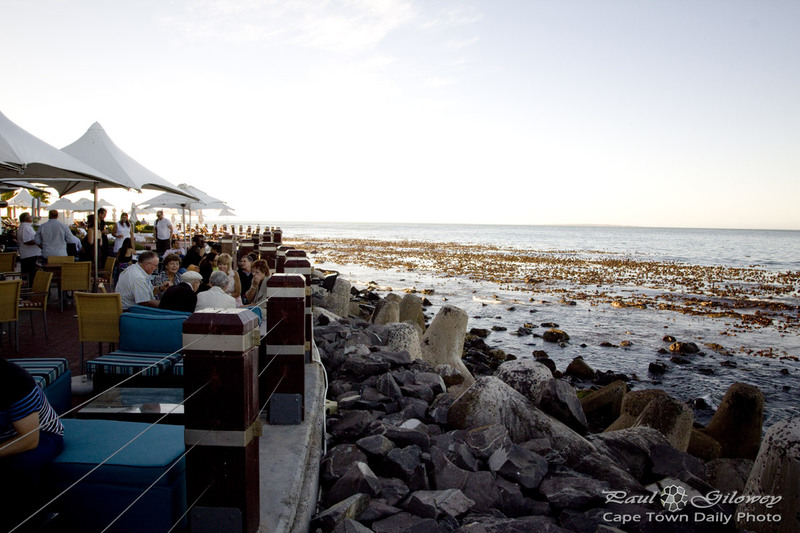 For reference, there are two Moyo restaurants near Cape Town - this one, at Eden on the Bay, and another at Stellenbosch's Spier Estate. Posted in General and tagged african, restaurant on Tuesday, 10 January, 2012 by Paul. 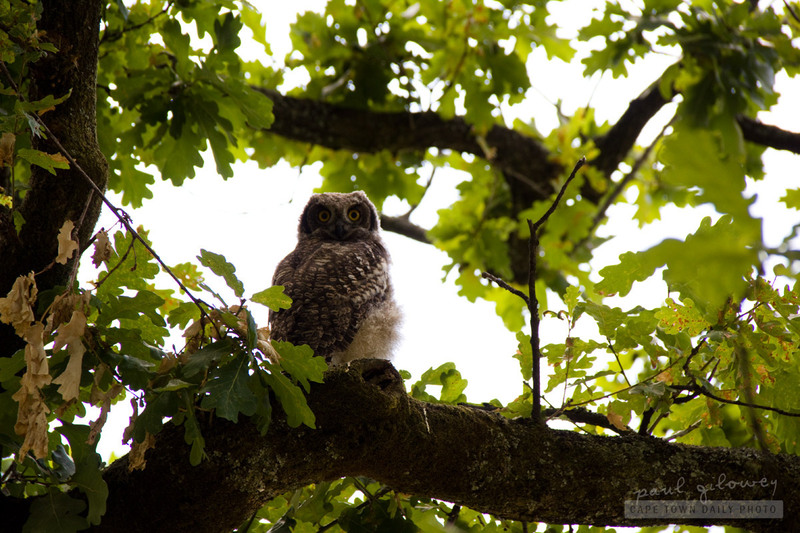 While visiting Boschendal wine estate's open-air Le Café restaurant for breakfast, one of my keen-eyed nieces spotted this owl sitting high up in a large oak tree, not far from where we were sitting. While the visit to Le Café was pleasant and not too expensive, the service was only alright. It wasn't 4 or 5 star quality - something that I would have expected from this well-known premium estate. The omelets and coffee that we enjoyed was good, but we found it strange that the omelets excluded cheese - something that I thought all omelets would contain. The open-air setting below large oak trees is very pleasant and relaxing, so even though our Le Café experience wasn't what we would have expected, it's still worth the visit. Posted in General and tagged restaurant on Friday, 6 January, 2012 by Paul. 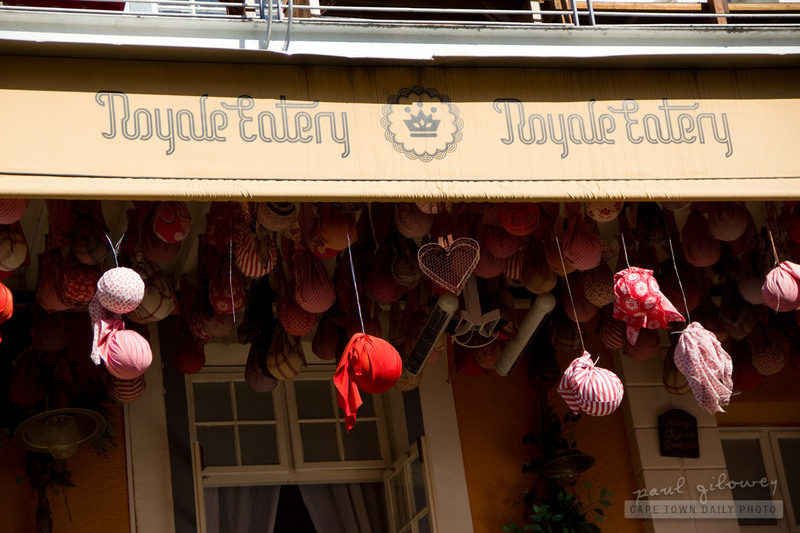 The main photo is of Royale Eatery's balcony that overlooks Long Street - which is arguably the heart of Cape Town's night life. Isn't the decor beautifully eccentric? It's so much more awesome decorated, don't you think? Even though the view from up top on the balcony is great - for some reason I still prefer sitting downstairs, and prefer visiting in the afternoon - before it gets very busy. 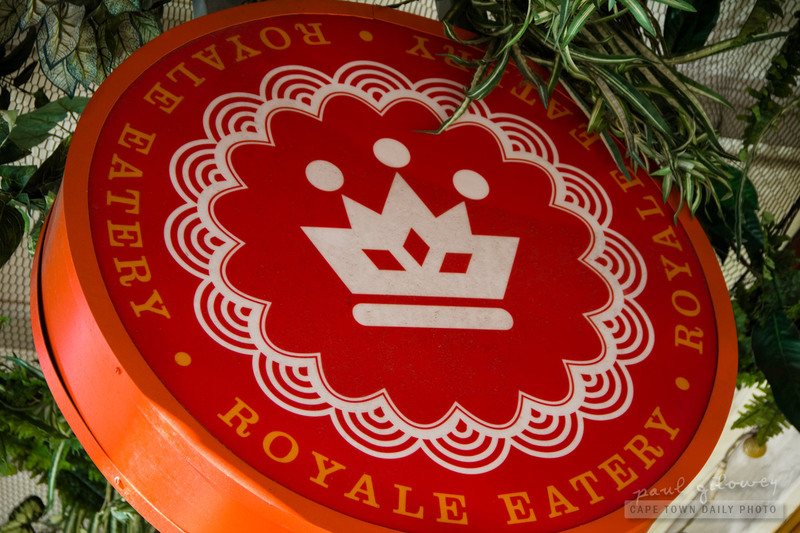 Royale's service has always been good, vibrant and cheery; and while it remains such the restaurant will always be one of my favourites. Posted in General and tagged restaurant on Friday, 21 October, 2011 by Paul. 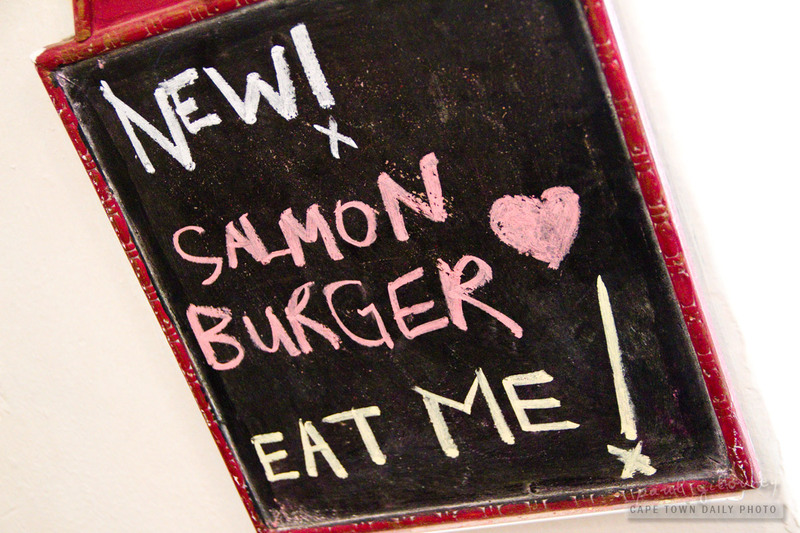 Now, it's only on rare occasions that I'd choose a chicken burger over a beef burger - but salmon? Really? Who would do such a thing?! Posted in General and tagged restaurant, signs on Thursday, 20 October, 2011 by Paul. 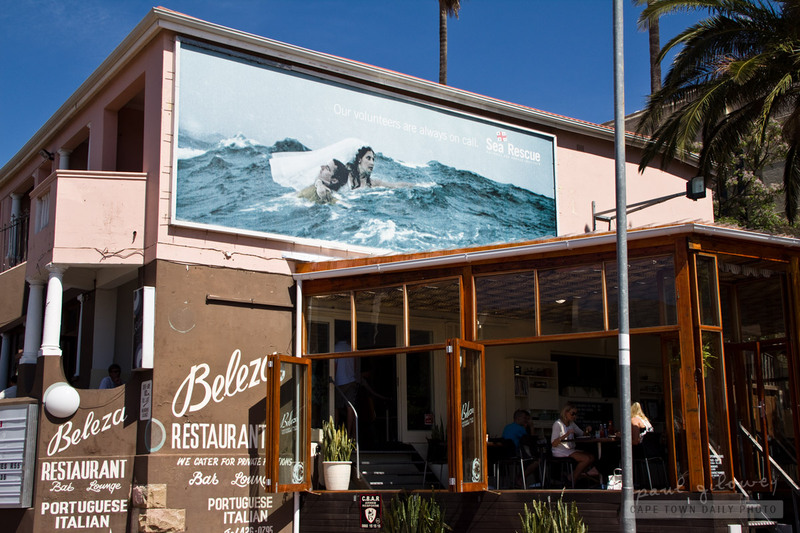 Beleza is, as mentioned in my previous post, currently my favourite breakfast spot in Cape Town. I especially love the open-air feel when they open the large windows on the deck and how the morning sun streams in on cool Spring mornings. Also, seems as though mostly university students work at the restaurant, so the atmosphere is a young and vibrant one - which is definitely a great way to start the day! Posted in General and tagged restaurant on Tuesday, 18 October, 2011 by Paul. 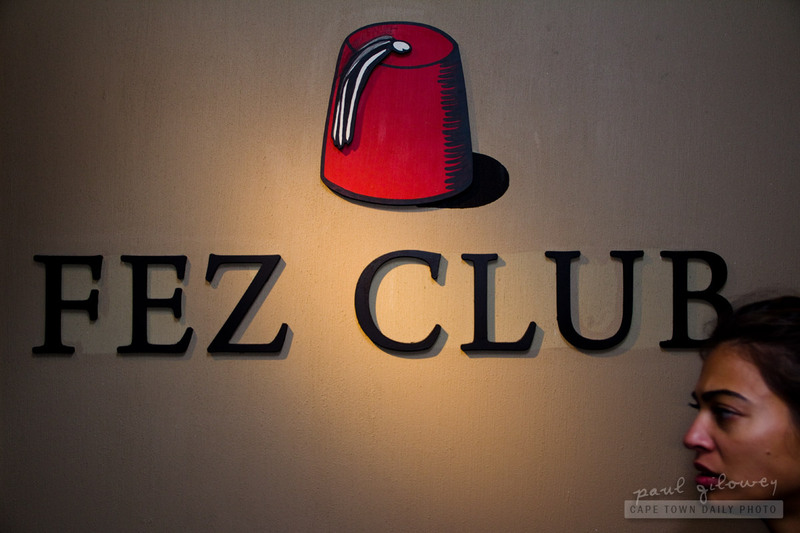 The Fez Club, as you may know, is a super-popular restaurant and live entertainment venue in Cape Town, similar to that of the legendary Madame Zingara (the portable restaurant that's located at Century City, just outside of the city center, until the end of 2011). Now, thinking of Madame Zingara; we haven't seen her in a long long while - I think we'll have to pay her visit as soon as Kerry-Anne's recovered from her hip op. 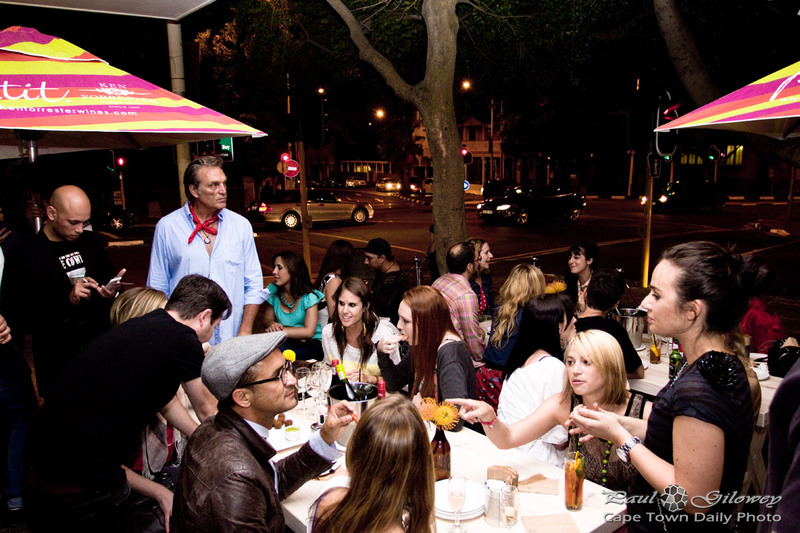 Posted in Activities and tagged entertainment, restaurant on Sunday, 16 October, 2011 by Paul. 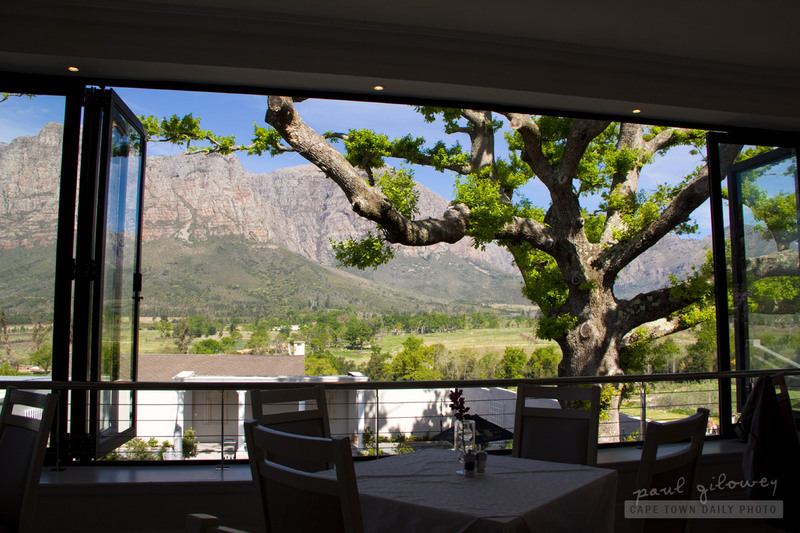 We took a short trip through Stellenbosch and across the Helshoogte mountain pass to the DeHugenote estate where we enjoyed one of the best lunches we've had in ages. Isn't the view from the restaurant the best? I found it difficult to capture the real splendor - but hopefully the photo is good enough to give you a feeling for how beautiful it was. Even though the food is fine-dining, the main and desert was enough to leave me full and not wanting for anything else. Lunch wasn't cheap, nor was it outrageously expensive. The (particularly-awesome) Chalmar Beef Sirloin cost R120 and Banana Split dessert cost R40. 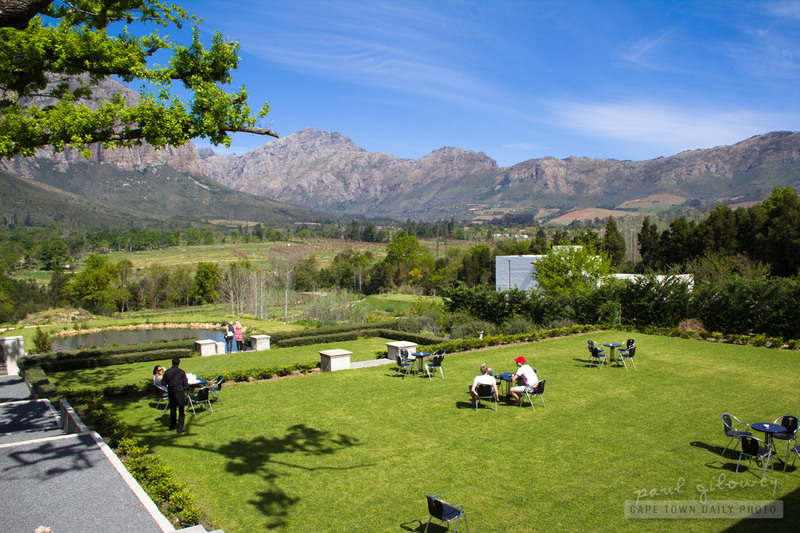 If you'd like a delectable lunch and good service in the countryside, then DeHugenot Estate is certainly worthy of a visit. Posted in General and tagged restaurant on Saturday, 8 October, 2011 by Paul. 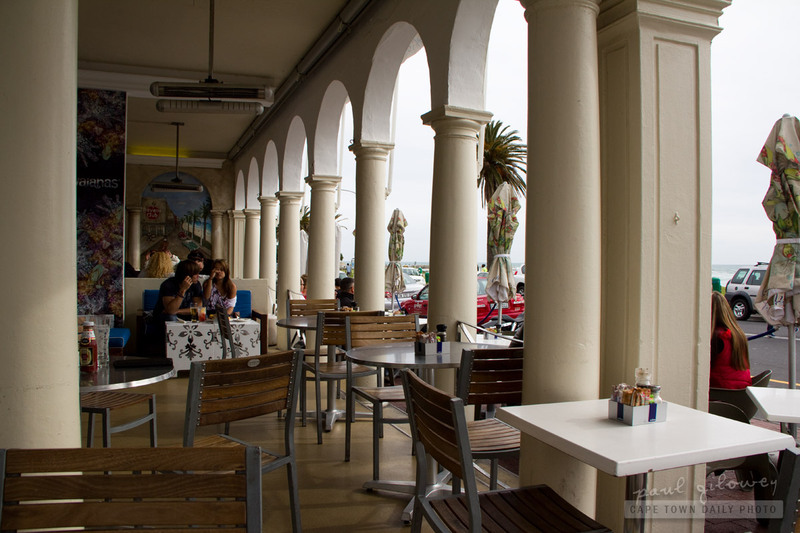 Without intention Cafe Caprice has become one of the restaurants that I frequent most when in Camps Bay. I was alone on this particular visit and grabbed a table in the outside section where I was able to watch passers-by as I enjoyed my lunch. I've been to Caprice several times for breakfast (the French toast is great) and for lunch a few times. Even though their burgers are acceptable, I'd recommend trying something else on the lunch menu, and I'd definitely recommend the breakfast menu. 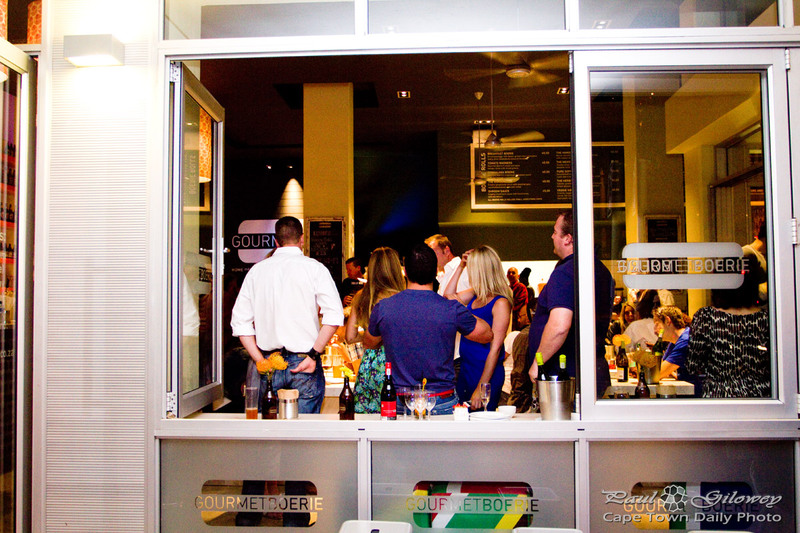 Besides for these, Caprice is the perfect place to enjoy drinks with friends on warm summer days. 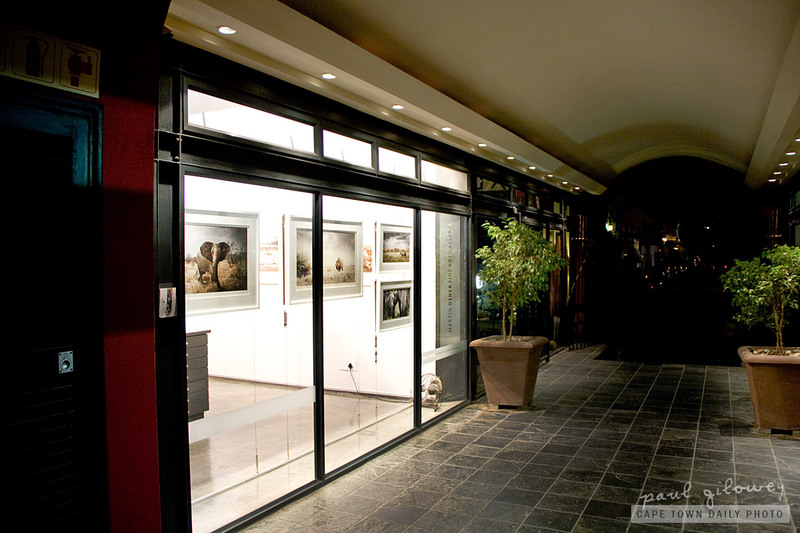 Posted in General and tagged camps bay, restaurant on Monday, 26 September, 2011 by Paul. We don't often participate in our City Daily Photo community's monthly Theme Day - I normally only realise a day or two after the first day of the month that Theme Day has come and gone! For interest - I took this photo outside a lovely little coffee shop called Kikka in the town of Paarl - some 60 kilometers outside of Cape Town. 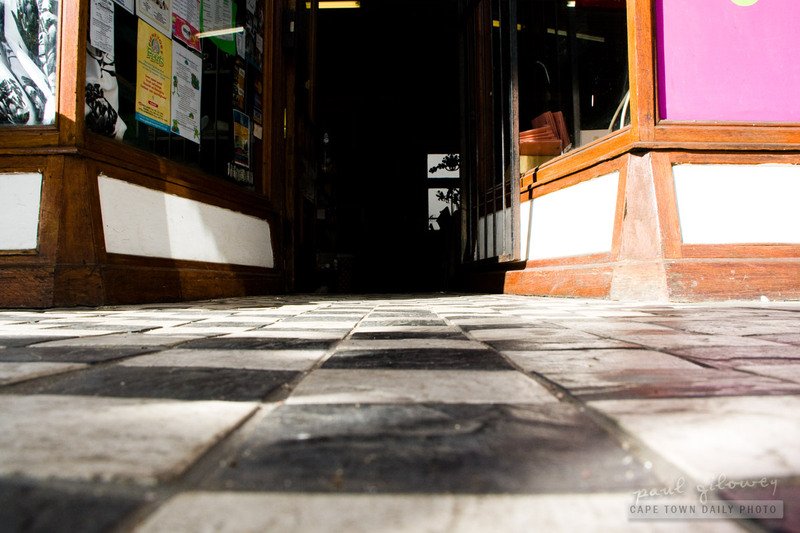 Posted in Street photography and tagged floor, paarl, restaurant, shop on Thursday, 1 September, 2011 by Paul. Tsuyo Japanese restaurant has no mayor! We visited Tsuyo for traditional Japanese Teppanyaki - which is a Japanese cooking technique whereby the food is cooked on an iron griddle. We started our meal with sushi (it's a Japanese restaurant after all) and then moved on to the main course. The sushi was pretty tasty - though not as elaborate as sushi prepared at some of the other well-known spots. The teppanyaki was pretty satisfying and fairly filling - so much so that we decided even to skip dessert. 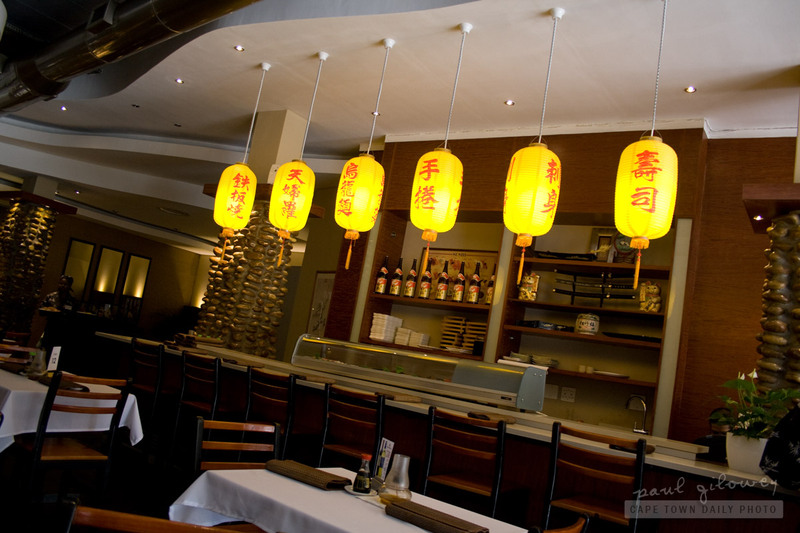 Posted in General and tagged japanese, lights, restaurant on Wednesday, 24 August, 2011 by Paul. 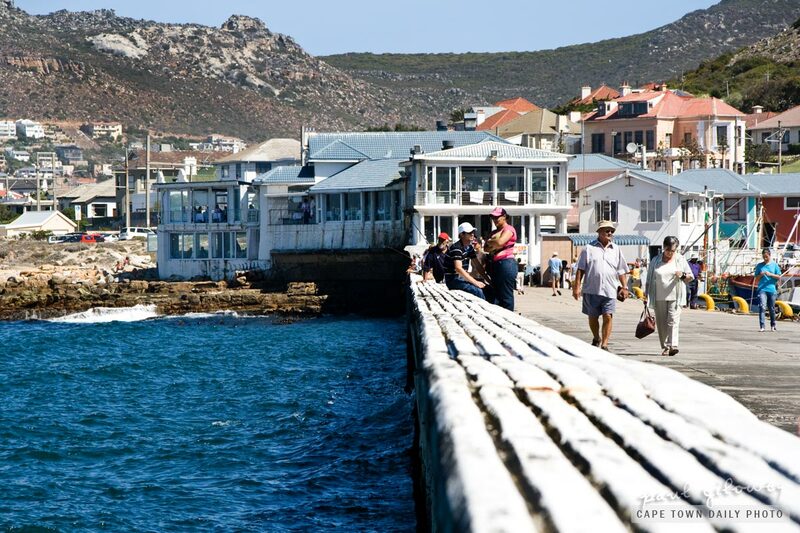 When you look back from the end of Kalk Bay's harbour pier you stare straight towards, what could be, one of the most popular breakfast spots in the little town - Live Bait. 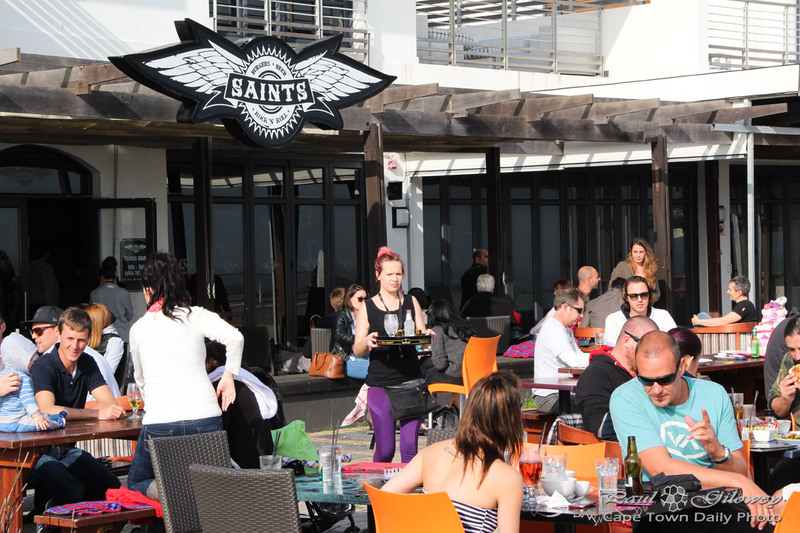 I wouldn't say that it's so popular because it's food is significantly better than their competitor's - I'd be more inclined to say that it's because they're perfectly located with a killer morning view of the sun rising over False Bay. Live Bait is certainly a place to visit for breakfast on a clear good-weather day. 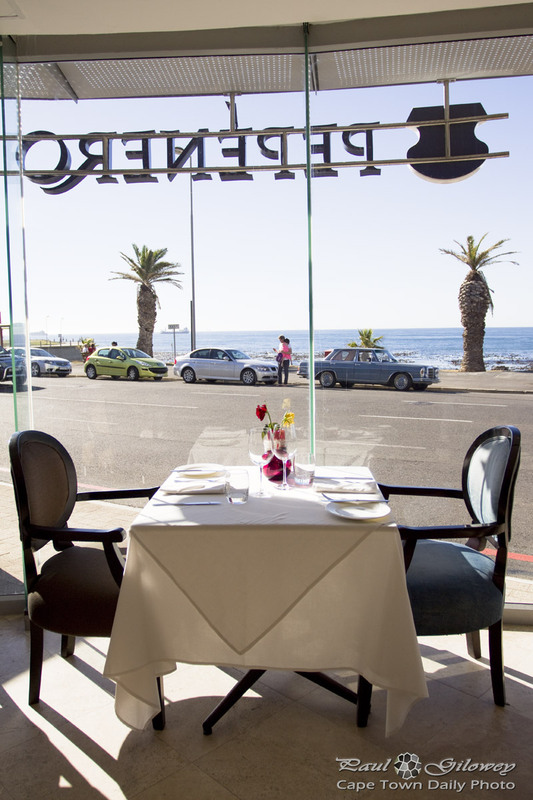 If you'd like to visit a slightly more posh restaurant, visit Polana (it's sister restaurant with even better views), positioned conveniently above. 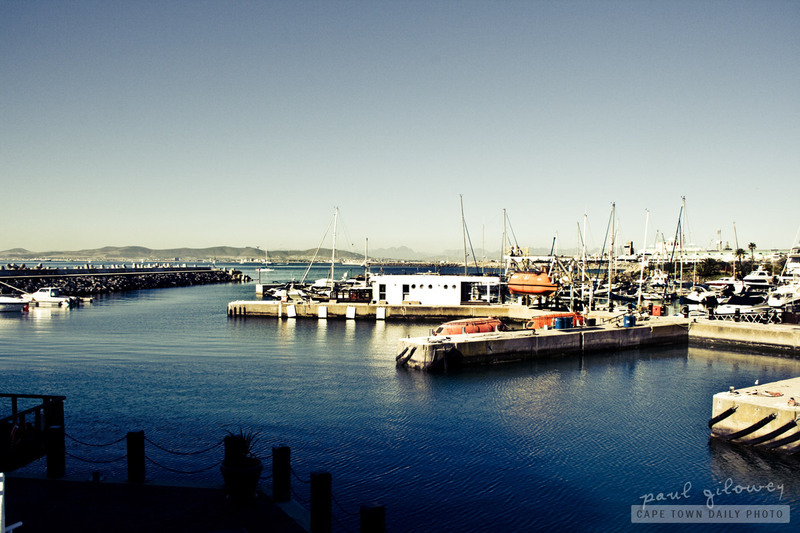 Posted in General and tagged breakfast, kalk bay, restaurant on Friday, 20 May, 2011 by Paul. Just to the left of where I took this photo is the five-star Radisson Blu hotel. One of the nicest things to do this time of the year is to absorb the suns warmth while sipping tea (or cocktails if your taste prefers) and eating cake at Tobago's Bar and Terrace. While visiting, be sure to take a walk along the breakwater (to the left of the photo) - and, when you're tempted to step out onto them, be extra careful not to slip and fall down between the dolose. I did so once - it sure was painful - I shall not repeat the incident. Posted in General and tagged boats, harbour, restaurant, sea on Friday, 6 May, 2011 by Paul. 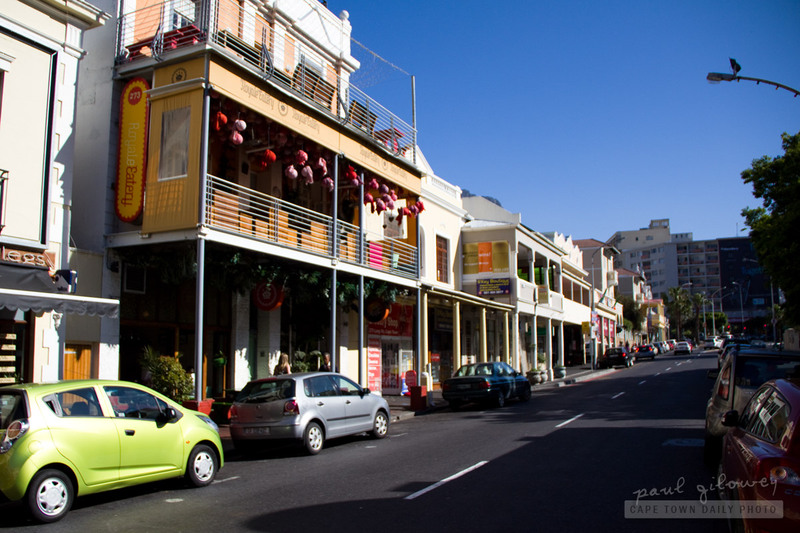 This is one of the entrances to the Cape Quarter. If you're visiting, or new to the area, you may be confused if you're unable to find this entrance, or the friends who promised to meet you. If this happens, the reason could be pretty simple - there are essentially two areas (separated by a narrow road called Dixon Street) that make up The Cape Quarter. This photo was taken at The Piazza, the open-air square (map), and if you can't find your friends, it's probably because you went to The Square (which, by the way, has fairly cheap underground parking). Posted in General and tagged restaurant, shopping, sushi on Monday, 2 May, 2011 by Paul. 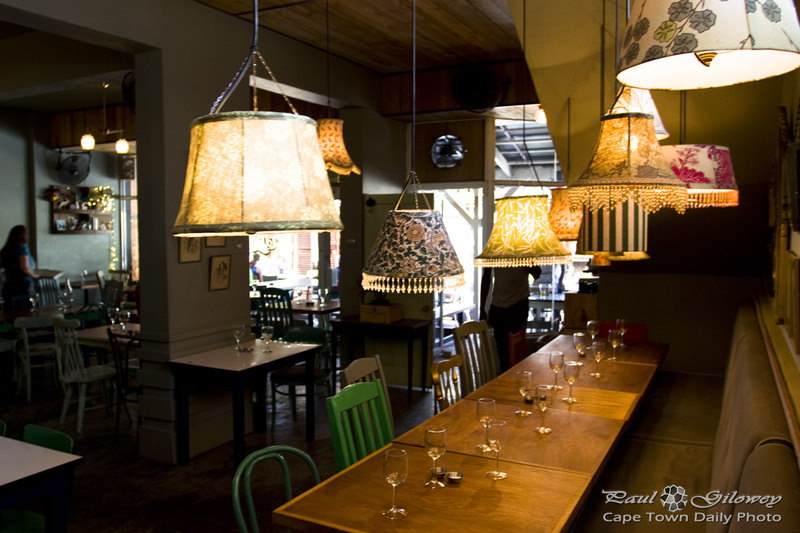 I took this photo inside of Den Anker, a well-known Belgian restaurant at the V&A Waterfront. 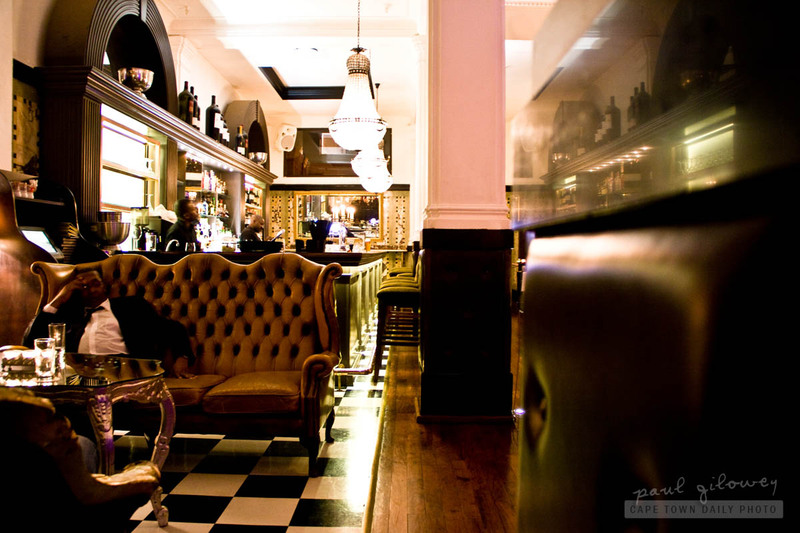 But, before you go thinking that Den Anker serves the best waffles in town... allow me to tell you my story. 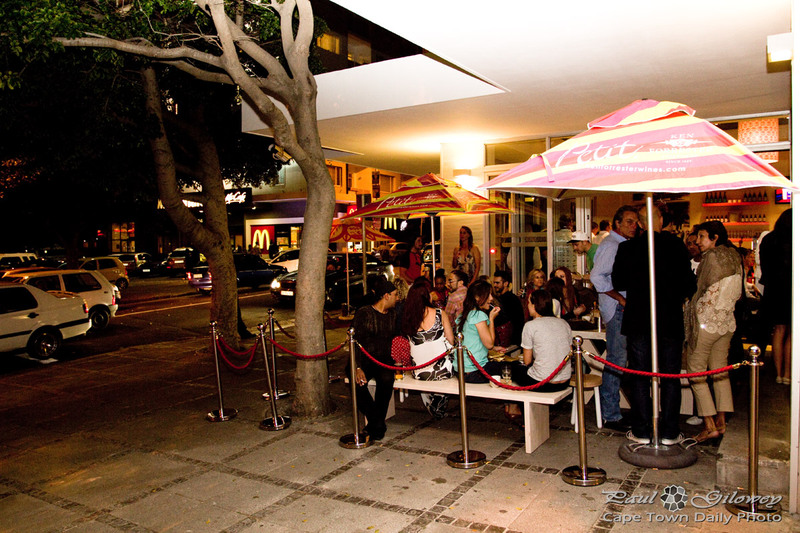 Several months ago we had waffles at a restaurant called Blonde, just behind the Company Gardens in Cape Town. The waffles that we had that night were undeniably the best that I'd ever (ever) tasted. I tried typing a sentence to describe how awesome they were, but I just can't seem to come up with something to adequately convey how great they really were. Subsequent to our visit to Blonde, we were told that Den Anker sells great waffles - so, we naturally headed over there to give theirs a whirl. Unfortunately, even though they were pretty good (and a definite second-place contender) the waffles that we had at Blonde significantly outclassed any waffle we've ever had - including those at Den Anker. Do you know who sells "the best" waffles? If so, and as long as you don't say Milky Lane, please do leave a comment on this post. Posted in Activities and tagged dessert, food, restaurant on Wednesday, 20 April, 2011 by Paul. Since this was our 13th wedding anniversary (we married young, by the way ;)), we decided to go to the classy Brio for fine dining, live jazz and a bit of style. All in all, the evening at Brio was pretty darn good. The small jazz band was awesome and the warm and cosy atmosphere was perfect. 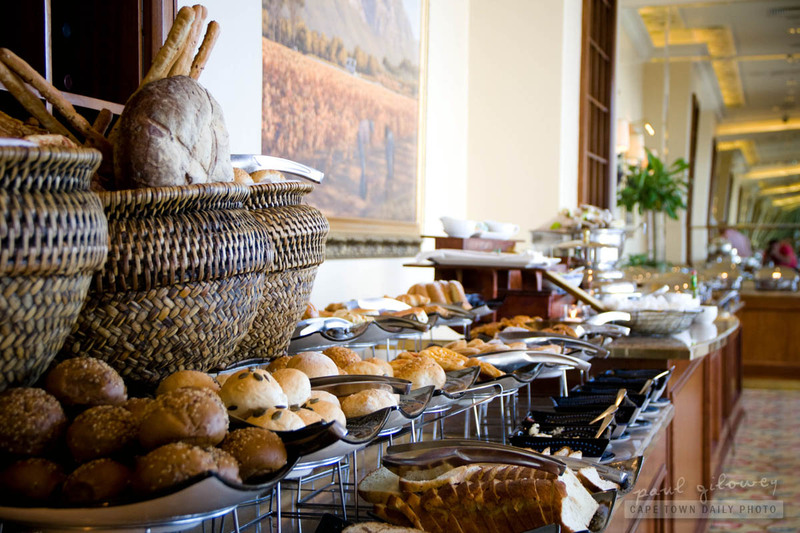 I'd recommend a visit, but be aware that it is fine-dining, so don't expect to pay Spur or Ocean Basket prices! Posted in Activities and tagged bar, restaurant on Monday, 11 April, 2011 by Paul. 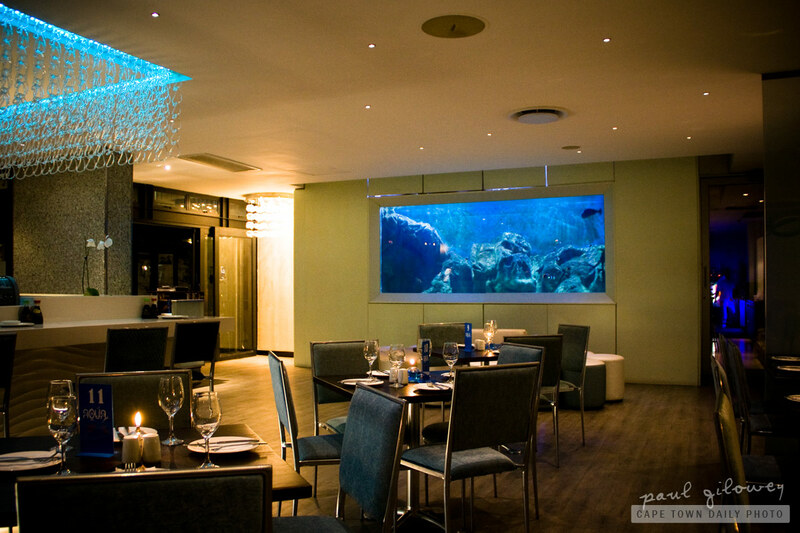 Aqua Restaurant at the popular Cape Quarter in De Waterkant use to be known as Tank - remember beautiful Tank? Well, the new owners have spiced things up a little and seem to have expanded the place quite considerably. The best place to sit is outside, in the square, but unfortunately by the time we booked all the outside spots had been snapped up by those smarter than I. All in all, I'd visit Aqua again, although I'd be smarter next time and book a table outside. For details I'd point you to their website, but to be honest it's as much a disaster as the sushi was, so for more information, a map, and a few photos visit their page on Dining-Out. Posted in General and tagged bar, restaurant on Saturday, 9 April, 2011 by Paul. The Pan Galactic Gargle Blaster is a cocktail described in The Hitchhiker's Guide to the Galaxy as "the alcoholic equivalent to a mugging; expensive and bad for the head.". Apparently, drinking one is like "having your brains smashed out by a slice of lemon, wrapped 'round a large gold brick." 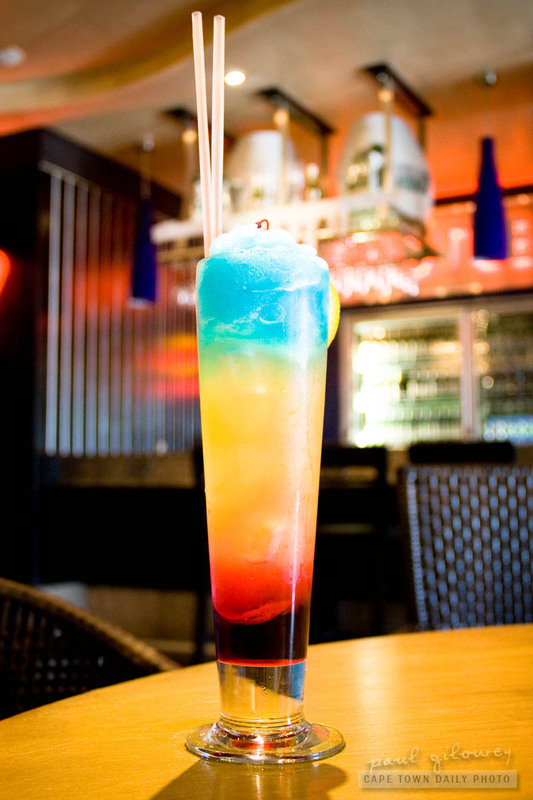 Kerry-Anne ordered this drink at Eastwoods Lounge, near Tyger Valley Center. She reported that the Pan Galactic Gargle Blaster never had the alleged brain-smashing effect on her and was fairly tasty, albeit just a little too sweet for her liking. Posted in General and tagged bar, cocktails, restaurant on Friday, 18 March, 2011 by Paul. 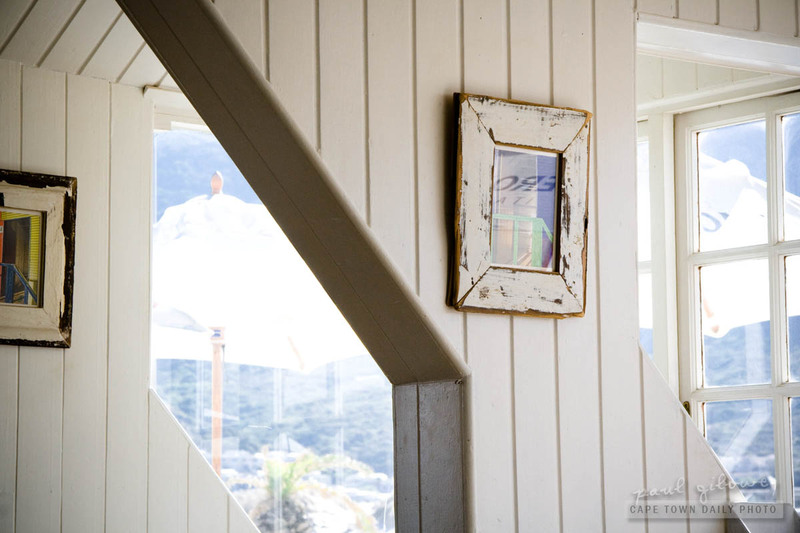 We popped in at Dunes Restaurant in Hout Bay to watch Cricket, have a drink and light snack. The waiter that greeted us at the door escorted us the the upper level that overlooks the beautiful Hout Bay, and seated us in a prime position to keep an eye on the Cricket while drinking and eating. Dunes is a great place to visit - it has plenty of interesting decor, they show the sport on big-screen televisions, and the service was pretty good. The olive starter that we had was however not that awesome (I'm told that some of the olives tasted pretty bad) and the portion of Calamari was tasty, but pretty meager for the price - we felt. This said I'd still recommend a visit. Dunes is a nice place to visit, it's located just over the road from the beach and I've had their Fish & Chips before - which, from what I can remember, was pretty good. Posted in Activities and tagged restaurant on Friday, 11 March, 2011 by Paul. 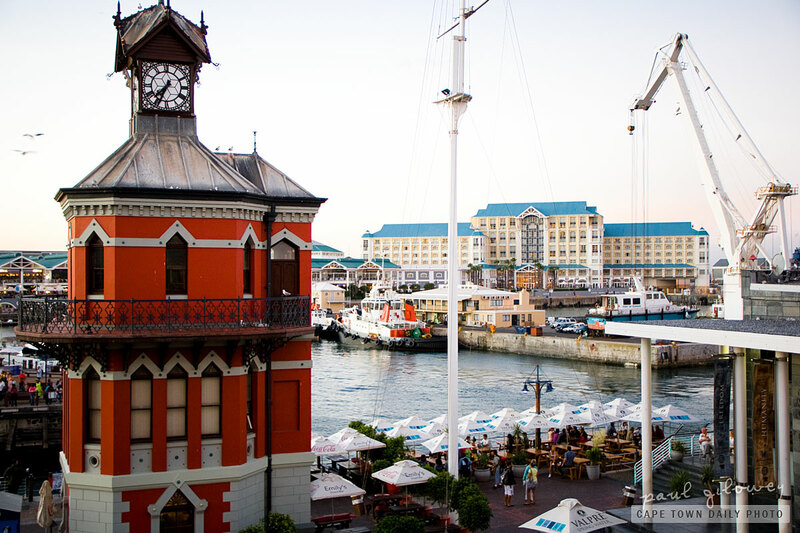 Emily's, a restaurant in the Waterfront's Clock Tower precinct has this beautiful view of the Clock Tower, Table Bay Hotel, and harbour basin. Even though the restaurant was empty (on a Friday night) the service wasn't very good. While expensive, the food was ok - but not particularly memorable. Also, it appeared as though the main meals were fairly different in size - leaving some of us still hungry after the meal. Although the restaurant is beautiful inside, and has beautiful views, with the huge array of restaurants to choose from it's probably not a restaurant that we'd return to in a great hurry. Posted in Activities and tagged restaurant, v&a waterfront on Friday, 4 March, 2011 by Paul. Den Anker took my shoe! 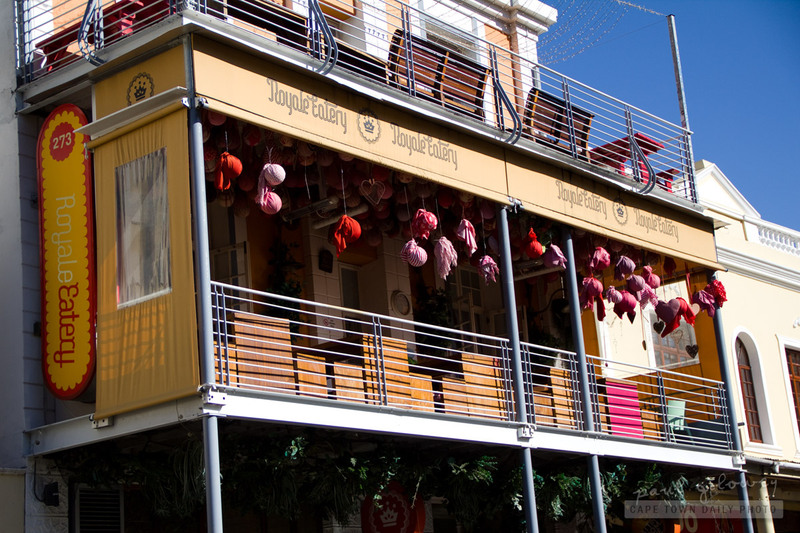 Den Anker is a popular upmarket restaurant at the V&A Waterfront that sells a large variety of dishes including super-fresh seafood. 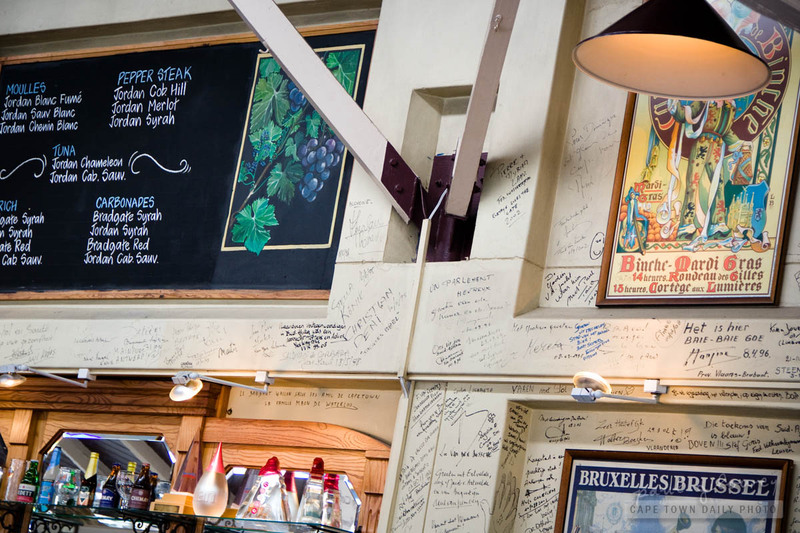 One of the restaurant's most popular traditions is that patrons are required to hand over a shoe as deposit when purchasing one of these beers. 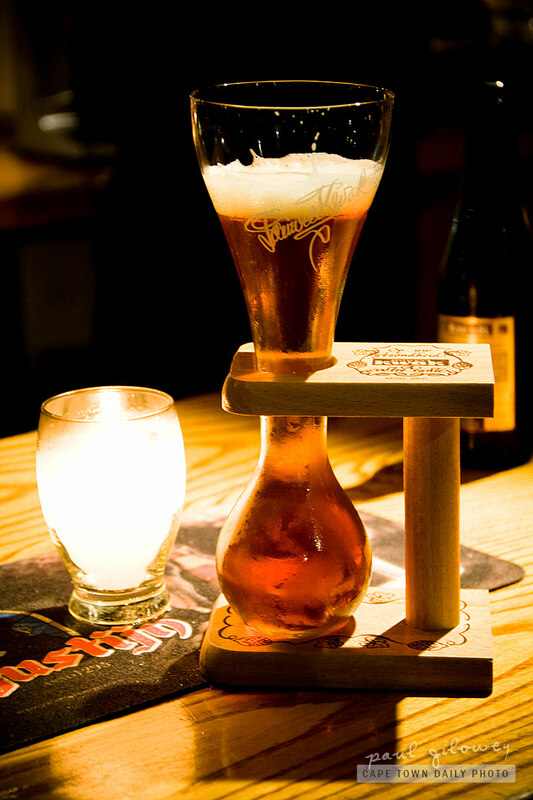 This 8.4% Belgian Kwak beer is served in it's traditional round-bottom glass that by accounts is pretty darn expensive to replace, hence the clever shoe-deposit! Posted in Activities and tagged bar, beer, restaurant on Wednesday, 2 March, 2011 by Paul. Posted in Activities and tagged breakfast, restaurant on Saturday, 5 February, 2011 by Paul.